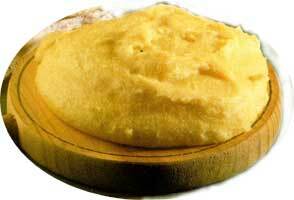 A Wine Guy's Blog: Polenta is the new........... ? Polenta is the new........... ? A few weeks back we hosted G man and Auntie Mads for dinner at our house. As always the conversation was excellent, and wide ranging but generally at some point during the evening G and I will get in depth over some food item or another. The evening's menu featured simple soft polenta, rich with butter, grated Romano and some fresh herbs so that was the focus of our food discussion. I love polenta, to me it is one of the great comfort foods, a conduit for butter, cheese and whatever else you may choose to add. I like my polenta best when it is soft and warm, right out of the pot, G man prefers to cool his, let it soften and then grill or fry. I'm a live and let live guy, food wise anyway, so either way is cool with me. Polenta is also one of those old school time consuming dishes that I have eschewed traditional preparation methods to lighten my work load. Traditionally polenta, in Italy, is cooked stovetop in a heavy pot. Water is brought to a boil and then the corn meal is added in a slow stream, temperature is turned down and the dish is micro managed for 45-50 minutes with constant stirring before butter and cheese are added at the finish. This results in a silky, buttery rich dish that is superb: but really who has the time, or inclination, to stand over a stove for 45 minutes stirring anything ? Bake, uncovered, for an hour and twenty minutes. Stir, bake ten more minutes and remove from oven. Stir in some more butter, grated romano/parmesan/asiago/whatever, and some fresh herbs (not necessary but a nice touch). Let sit for five minutes and serve. That's it, no fuss, no muss just great soft polenta. You can top this with sauce, mix in sauteed mushrooms, shredded meat, whatever or just eat plain. The leftovers can be saved and grilled or sauteed the next day and they will be delicious. Polenta is the new Risotto. This is a worthy analogy, they both have roots in Italian cuisine, they both were highly time consuming dishes that can be reduced in their labour requirements, they are both starches that serve as a vessel for other flavours. To me, however, risotto is not the comfort food that polenta, and risotto is simply a bit too precious. Even faux-sotto, short grain rice cooked slowly but without the manic stock adding, constant stirring that risotto requires, isn't as simple a pleasure as polenta. Polenta's humble roots, as a simple mush and the staple of Roman legions, and no pretense cries out for something other than the much feted risotto. For me Polenta is the new mashed potato, except it's better as a leftover than the spud, and that's alright with me.